Good morning from Germany. The FOREX market seems to have started the New Year quietly and most of the major pairs have trading sidewise. Anywise, we wish you a nice trading day with successful trades. The USD climbed against all its 16 major counterparts after an official at China’s sovereign wealth fund said that he saw an end to the U.S. currency’s recent decline. The EUR/USD fell to 1.4451 after opening at 1.4511. The JPY fell against the USD after investors expected that Japan’s exporters brought home profits overseas. The AUD/USD fell from near a two-month high after a report showed that home-loan approvals dropped in November by the most in 18 months as a result of central bank Governor Glenn Stevens increasing interest rates. The AUD/USD closed at 0.9290 after falling to a low of 0.9236. It reached yesterday a high at 0.9326, which was the highest level since the middle of November. The NZD traded near its strongest point since November 19th against the USD after a report published that capacity utilization rose in the fourth quarter and the outlook for employment improved. Yesterday the NZD/USD touched its high at 0.7438 before rebounding to 0.7408. The NZD/JPY has also recovered from a record high. Last Friday the market reached a high at 68.67, which was the highest point since the end of October. 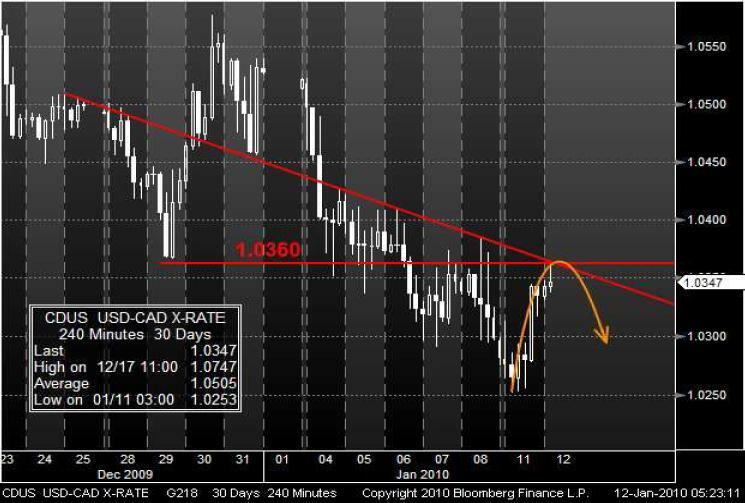 As you can see, the USD/CAD has been moving in a downward along a bearish trend line. 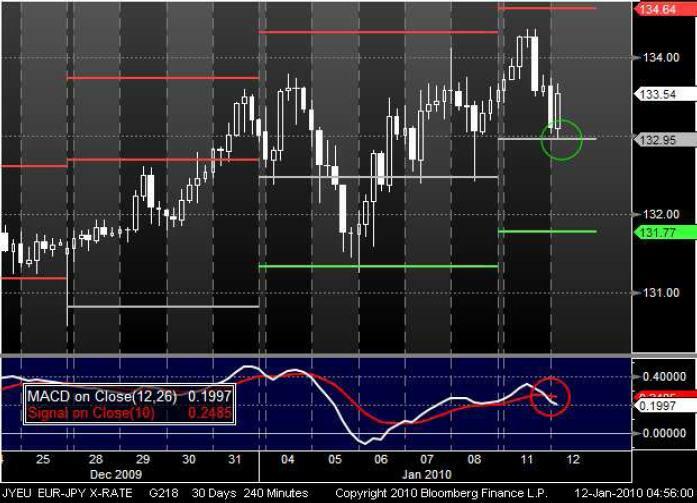 After reaching a low of 1.0253, which was the lowest point since the middle of October, the market pulled repeatedly back and touched both lines, the downward trend line and the horizontal level around 1.0360. If the market does not break these resistance lines, it may return back towards the low from October. Since the January 5th the EUR/JPY has been gaining along the weekly pivot points. After it touched its one-month high around 134.40, the pair pulled down and reached the middle pivot point. As you can see the MACD is signalizing a recovery to the downside. This signal may be confirmed by a break through the middle pivot point at 132.95.